Fraley Memory Productions of Akron Will Be Taking Star Wars Photos This May! Unlike some other professional photographers out there, Fraley Memory Productions likes to keep things fresh and exciting. Incorporating new props and backdrops allows this talented duo to better serve their clients. Plus, they know that pictures tend to come out better when the subject actually wants to be in them—a fact that’s most obvious in kid photography. Next month, this Akron-based establishment will be taking themed photos to a whole new level, giving parents from North Canton to Tallmadge the opportunity to obtain some truly out-of-this-world images of their children just by signing up for a mini photo session! That’s right; Fraley Memory Productions will be taking Star Wars photos this coming May! 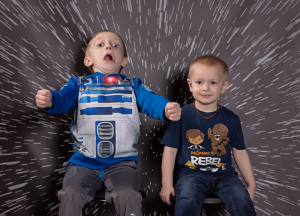 For families around the Tallmadge and North Canton areas that love everything about George Lucas’ epic tale of adventure set in space, Fraley Memory Productions’ mini photo session is definitely worth checking out. 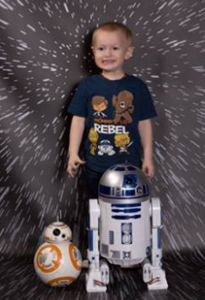 Not only do these themed photos differ greatly from other pictures that parents have of their little ones, but the talented individuals from this Akron-based business go above and beyond to ensure that every child has a ton of fun! Since it’s difficult to capture a genuine smile during a kid photography session, those who take advantage of this upcoming event will be impressed with the end result. It’s important to note that mini photo sessions are only available for a limited time. The upcoming Star Wars photo event will take place on Saturday, May 14th from 10am-2pm. During this 4-hour period, the professional photographers from Fraley Memory Productions will be doing 20-minute sets with each subject. 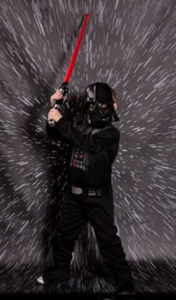 Children will be able to fly through space, hone their lightsaber skills, and even meet a “real” Jedi! A variety of props and backdrops will be available specifically for this event, adding to the overall effect. Needless to say, parents will be able to look forward to an enjoyable kid photography session with Fraley, especially when they discover how affordable it is! For just $50, parents can sign their children up for a 20-minute mini photo session with the professional photographers from Fraley Memory Productions. Families from throughout the North Canton, Ohio and Tallmadge, Ohio areas are more than welcome to participate in this fantastic event, but spots will undoubtedly fill up quickly. Anyone who wishes to take advantage of this fun and reasonably priced deal is encouraged to give Fraley Memory Productions a call at 330.703.9228 to reserve their spot. 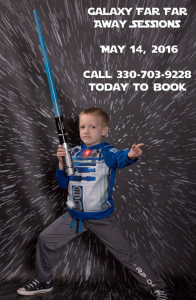 Any questions about the Star Wars–themed photos being taken at this Akron, Ohio-based business can also give the Fraley team a call. They’d be happy to offer additional information about their kid photography services. This entry was posted in Photography and tagged Fraley Memory Productions, kid photography North Canton Tallmadge Akron Ohio, mini photo session North Canton Tallmadge Akron Ohio, professional photography North Canton Tallmadge Akron Ohio, Star Wars Photos North Canton Tallmadge Akron Ohio, themed photos North Canton Tallmadge Akron Ohio by admin. Bookmark the permalink.